WC has fallen behind in his email again. It’s past time to sort through the contents. Mrs. WC discovered Brian Kesinger, an amazingly creative visual artist. He works for Disney, but moonlights as a cartoonist, author of Walking Your Octopus and a stunningly creative Calvin and Hobbes-Star Wars mashup. That’s pretty good, but this is even better. There’s an immense amount of pure crap on the internet, but sometimes you stumble across content that just amazes you. Reader Ryan points out that WC may have gotten a shorebird ID wrong. 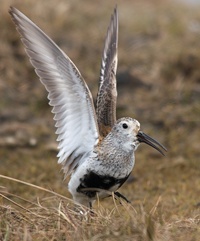 WC has asked a world shorebird expert to weigh in. WC will report when he hears back from Nils. We have been conducting some experimental research this year to try to determine whether there is a causal relationship between Poecivirus and AKD or if it is just correlational for some other reason. We’ve been cohousing individuals with AKD (and infected by the virus) with naive individuals (uninfected, non-AKD) to see if (a) the naive individuals become infected and (b) if they do, if they then develop deformed beaks. We’re in the middle of this experiment and should have results in the spring. In the interim, we’ve also been testing individuals of other species that have beak deformities to see if the virus is also present in them, and have found Poecivirus, or a close variant, in all of them. We’ve also tested a larger sample of black-capped chickadees and have confirmed our previous findings. We’re currently submitting a new manuscript on these results for publication. WC will let readers know when the research gets published. Once again, props to Dr. Handel and her colleagues for their long effort to understand this issue. Finally, if you don’t already know, Dermot Cole, WC’s favorite Alaska journalist and pundit, now has his own blog. Cole told WC, “The lack of good analysis in the ADN and the News-Miner, allowing Lisa, Dan and Don to peddle nonsense nonstop, deserves to be countered.” Amen to that, and WC cannot think of a better person to do it. You’ll find the link over on WC’s blog roll on the right hand side of this page. PS. Yes, it’s true, WC’s household has a new puppy, a rescue dog from the Idaho Humane Society. If you really want to hammer your productivity, get a puppy. Congrats on the new puppy, what a stinker faced cutie!